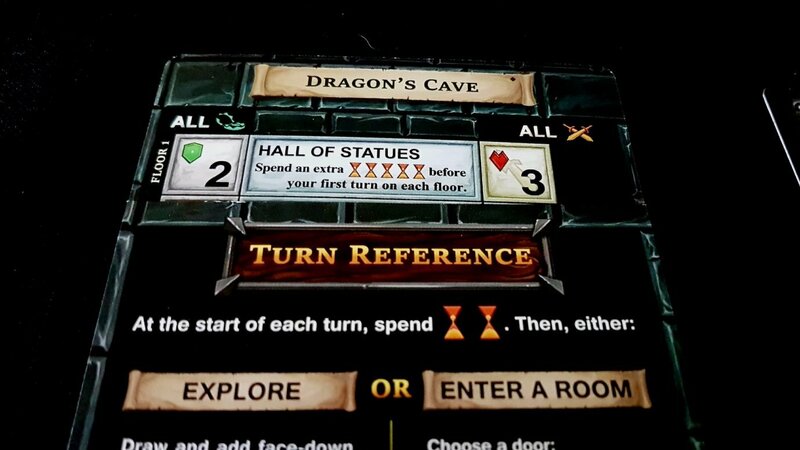 Oooh, One Deck Dungeon was an unexpected treat. I bought it mostly on a whim largely because I wanted to talk about its approach to inclusion in the art. It’s an all woman cast which is simultaneously something of which I entirely approve and completely disapprove depending on which hat I’m wearing. One of those hats is worn by a guy who would like to see games become more inclusive over the long term. That hat belongs to someone that understands a thing might be bad in one context but (almost) entirely okay or perhaps even positive in another. The other hat is the jaunty fedora worn by the tedious guy pushing his glasses up his nose and saying ‘Well actually, m’lady’. That guy will have more to say in the teardown. This guy right here in this awesome floral bonnet – your ol’ pal Review Michael, in other words – thinks it’s great. I bought the game to give me a chance to bang a couple of drums and I won’t apologise for that. I wasn’t really expecting it to be an especially good time given the premise. 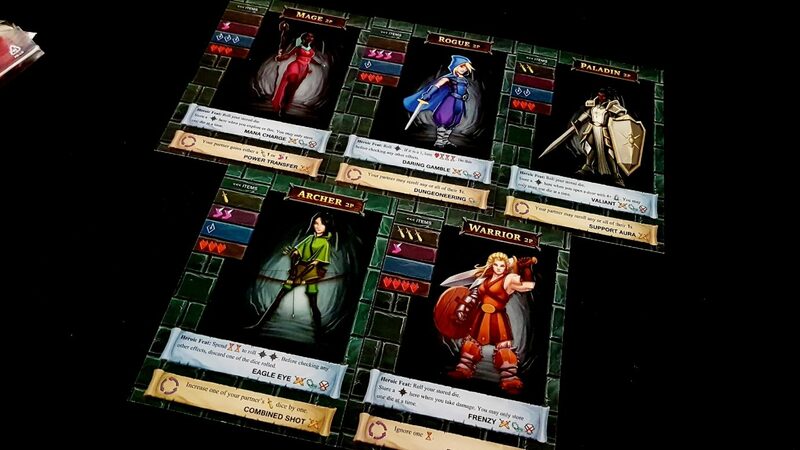 It’s a roguelike dungeon crawl where a single deck of cards is used to give, purportedly, all the experience of a changing dungeon with random loot and leveling up. That’s a lofty challenge for a game to set itself even with the full toolkit of a big box board-game stuffed with miniatures and campaign books. A roguelike lives on its ability to create new and novel experiences while always leaving the player feeling as if there’s more yet to be discovered. A roguelike needs to feel like there is some random drop somewhere in the deep bowels of the machinery that is still to be revealed if people dig deeper. I spent many happy hours of my youth playing roguelikes, from Rogue itself through to Angband and Moria and beyond. I know first-hand from my own game development endeavors how difficult it is to enable meaningfully endless replayability within the confines of a fixed game system. 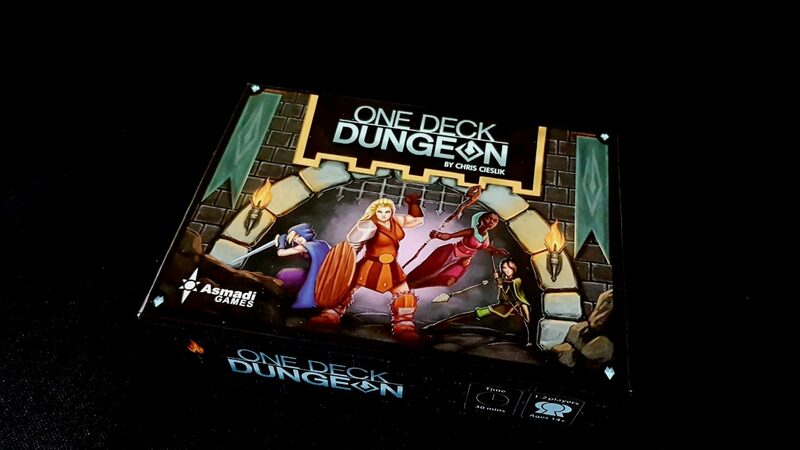 Imagine my surprise then to find out that One Deck Dungeon almost but not quite manages it with nothing more than the eponymous single deck and a buttload of brightly coloured dice. I know that sounds like faint praise, but it has to be assessed in context – this is a really, really difficult thing to do properly. 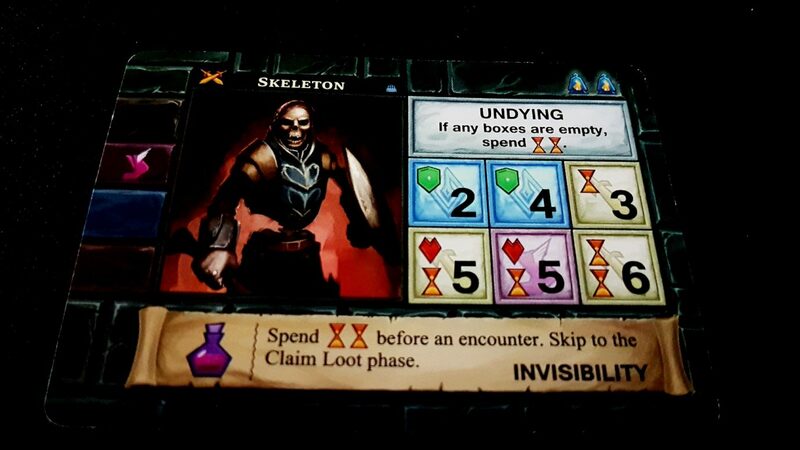 One Deck Dungeon is a great game and it’s not getting out of this review without being lavished with praise even if it doesn’t quite meet its lofty aspirations. It is in the end one deck and that deck contains few mysteries once you’ve made your way through the dungeon a couple of times. My only real, substantive criticism with One Deck Dungeon is that there needs to be more of it. Not new expansions or more game systems – it just needs a bigger, richer and more unreliable stack of cards from which to draw its stories. That will I hope come with time, and the deck you get in this box has happily sustained me for a dozen or so games already. It’s just at this point that the dungeon I’m exploring feels like it’s trapped in a Groundhog Day loop where I’m constantly meeting the same people in slightly different ways. I don’t want to keep meeting Ned Ryerson in a range of different hats – I don’t want life insurance, I just want to kill something new and turn its skin into a uniquely interesting set of calf-high boots. At the root of the problem is the way the deck works – it represents time, equipment, skills, experience and encounters within the dungeon. You use the whole deck every single time, and the only thing that changes with each descent into darkness is the meaning that any individual card assumes. The dungeon you’re exploring has three levels, and each time you get to the end of the deck you’re presented with the option to descend and you’re compelled to do so by the accumulating risk of damage that comes from trying to delay it. Each turn, you draw two cards from the deck and discard them – these represent grains of precious sand cascading inexorably from the life-timer of your adventure. You then get two choices. You can explore, laying down four cards face down for your budding door to door violence delivery business. If you’ve got doors already out, you can enter one and have the encounter revealed by flipping it over. Already you can see that these are some of the hardest working cards in gaming today – each is doing two jobs without a glimmer of complaint. Flipping over a card sets it up as the challenge to be faced. This might be a peril which presents you with a decision to take as to which innate abilities you’ll use to face it. It might be a fight, which uses all your abilities in a rollicking punch-up between everyone playing and the beast before them. 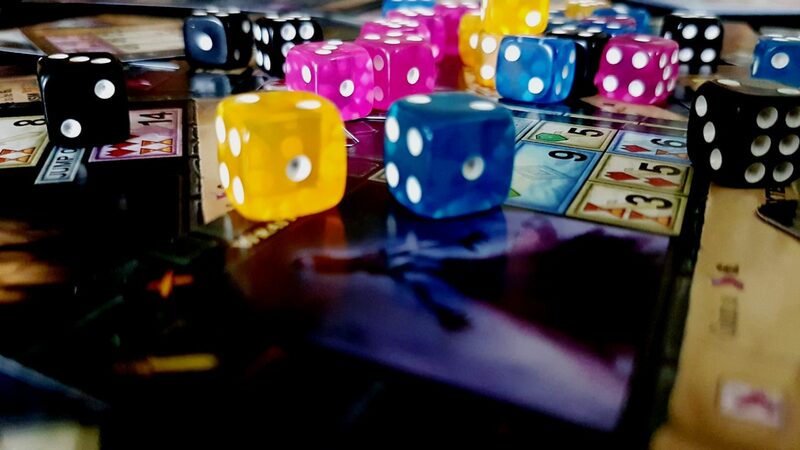 In either case, you face it the same way – you all pool the right colours of dice together, you roll them, you use whatever special abilities you can to influence the outcome, and then you portion out those dice to the challenge before you. You need to assign the colour indicated by the box provided, and of at least the value required. Some boxes can only accept a single die, others permit you to spend as many dice as you like. As you go on, you’ll accumulate black heroic dice that can be used for any kind of encounter. Some slots are marked with shields, and must be covered before any other slot can be dealt with. No matter how many of these you leave uncovered you progress on to the next encounter and claim the card from this one as a success. However, every box you don’t correctly cover will inflict time and health damage to the adventurers. 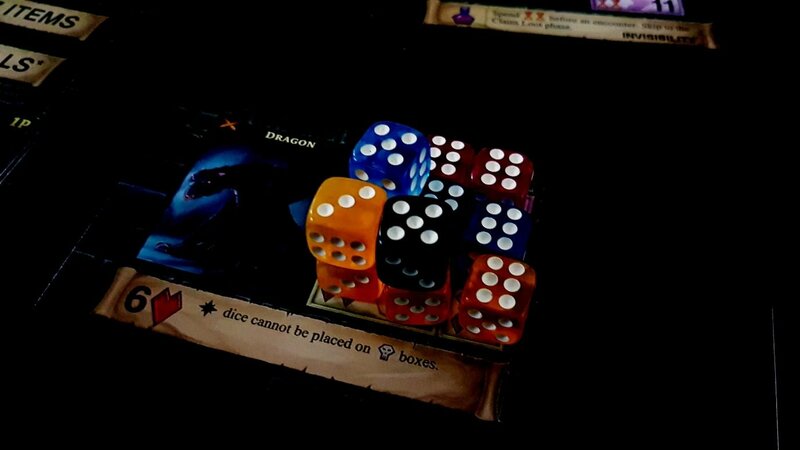 On the surface this is about as passive a game as you can get – roll dice, assign them optimally. However hold on to your bums because things are about to get interesting! 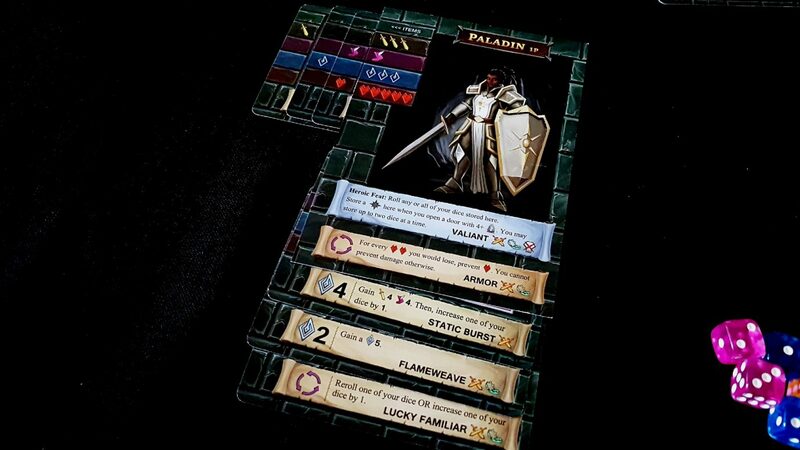 Every character gets a set of dice that play to their role – the paladin emphasises combat and magic . The rogue emphasies agility, the warrior combat, and the mage magic. For the solo game, you’ll get a decent handful of dice to throw but for the co-operative adventure everyone has their own mini dice-pool to manage. And here manage doesn’t mean ‘roll’ – it means ‘use all your powers in a way that is all but indistinguishable from cheating’, and it’s gloriously satisfying. As you progress you’ll bolt in new capabilities to your adventuring party, and you’ll do that using the card you just collected from the encounter you (hopefully) survived. 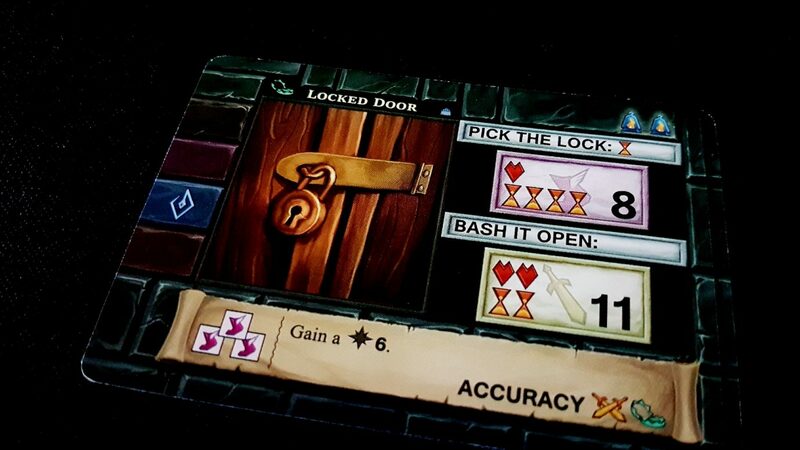 The exploration part of One Deck Dungeon is handled by the deck, but so is levelling up. Take a close look at the skeleton card above. At the left edge is an agility symbol. If you survive this challenge you can convert that card into an item that gives you an extra agility die in your dice pool. The thematic conventions underpinning this are… troubling. I don’t know what you’re doing with a skeleton carcass to make you more nimble, and I don’t want to. I assume you’re grinding it up and snorting it, but what do I know. You kids today. Whatever you’re doing, you can use the spoils of your victory to make yourself stronger, faster, healthier, or more magical. It just depends on what the card does. That’s neat! You grab it, slip it under your character sheet and bam – new dice for every encounter. Just leave the sword in a safe place. Or you could look along the bottom – that shows a skill you can claim. It lets you, under certain circumstances, break the traditional rules of the game. With the locked door, you can trade in any three of your poorly rolled agility die in exchange for a shiny six heroic die. The icons at the bottom right of this show under what circumstances that’s possible – in this case, both combat and peril encounters. Layering skills together gives you a powerful toolkit for turning even your cack-handed rolls into things of beauty and grace. They sometimes let you transmute dice from one type into another, or change the rolls, or sometimes even simply say ‘I don’t like all those ones, so let’s make them all sixes’. Each skill needs fuel to make it work though, and those usually come at the expense of the dice you already have. Your job in each of these encounters is to convert your dice so you can optimally deploy them in a way that minimises the unpleasantness that will be delivered fresh to your face at the end of the allocation. Skills are the alchemy that permits you to do this without simply relying on the randomness of your rolls. Or, you can take the card and look at the top right – that tells you how much experience you can earn from cashing it in. If you get enough experience, you go up a level. You can only have a certain number of skills and items in play at any one time, but that cap goes up with the experience you invest into your party. Higher levels give you access to heroic dice you can add to your pool and potion tokens you can use to give yourself a temporary pick me up when the dangers of dungeon delving become too significant to bear. 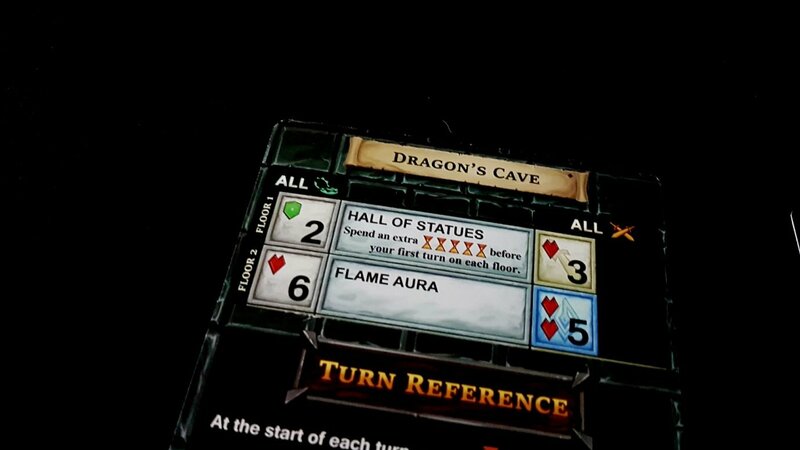 Your problem is each card can only do one of these and every single level of the dungeon comes with an expiration date. You can’t just meander around hoping to collect everything you need – before too much time has passed you’re going to have to go deeper underground. No-one could blame you for running away. It’s the dungeon, you see, that adds the ever escalating challenge to the adventure. When you hit the end of the deck you reshuffle and start again – the inevitable result of that is that your skill level rapidly outpaces the challenge. There are some very tough encounters in the deck but they’ll rapidly fade into insignificance as you start accumulating dice and powers. 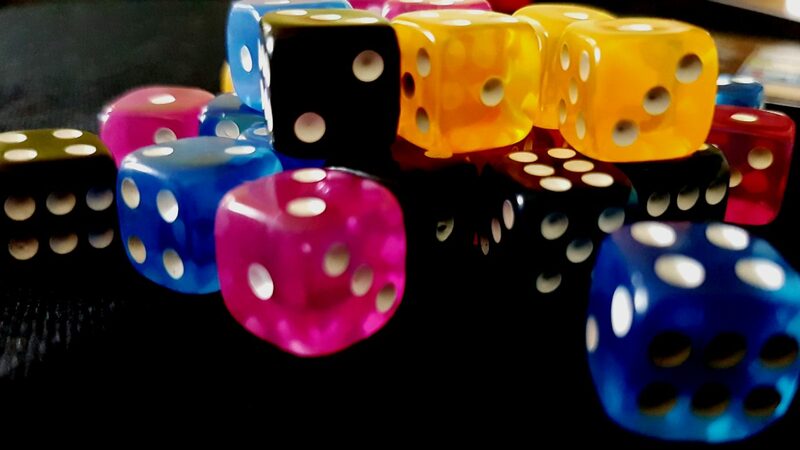 When you’re throwing a dozen dice at any of the challenges you’ll face, very few of them will stand up to the onslaught. The dungeon though… that has other ideas. As you descend ever farther down into the dungeon you reveal another level of its effects. These are additional difficulties that attach to every single encounter you face. While the monsters don’t scale, the dungeon you’re exploring ensures that you’re never able to become too complacent. New challenges compound too – they don’t replace existing challenges, they add on to them. It’s like every single monster gets its own little power-up every time you set foot on a staircase. If you play cleverly and level up wisely you’ll find yourself keeping pace with the challenge. If not you’ll find the dungeon will hammer you and your friends into a brand new shape. It’s not especially difficult to get to the end of the dungeon, but it’s easy to stumble and fall under the compounding weight of misjudged advancement. The path you take to level up is just as critical to your success as the specific way in which you allocate the dice you have available. Dungeons also come with a difficulty level, and that level goes up as you make your way through the campaign. The dragon’s dungeon is little more than a tutorial level – easy enough to defeat while still teaching you all the key systems of the game. The dungeons you face will get increasingly more deadly with ever more punitive effects associated with descending. 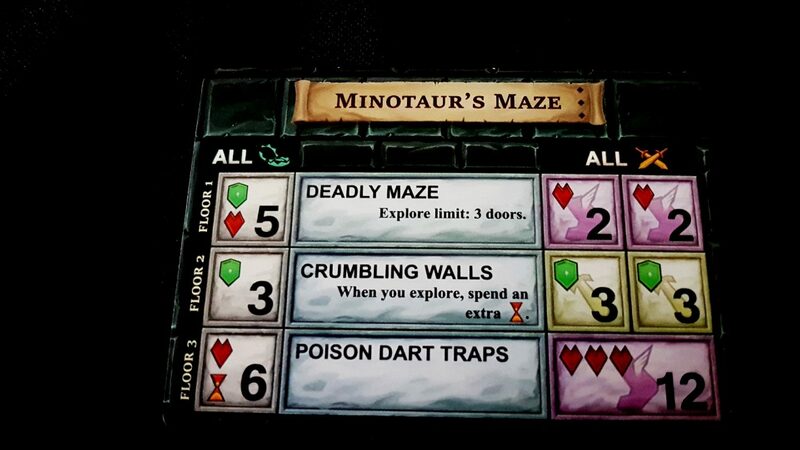 They’e all deeply thematic too – the Minotaur’s maze for example models the complexity of its layout by limiting how many doors you can explore. As you go deeper down, you encounter a situation of increased decay and erosion, meaning every single exploration action takes more time as you carefully make your way around the crumbling stonework. It’s extremely lightweight environmental story-telling that still manages to be deeply evocative of the character and nature of the dungeons you are exploring. It’s not that they feel like real places, but the sketches they draw of heroic adventure are compelling and effective. When you’ve reached the bottom of the third floor of the dungeon, you face the real challenge of the exercise – the powerful boss that lurks at its termination. Here, the game shifts gears and becomes a multi-round endeavour in which you attempt to cover up specific slots that inflict damage whilst trying to prevent too much of it being reflected your way. Heroic abilities don’t work here, and each boss will have their own peculiar idiosyncrasies in how they choose to deal with intruders. It’s entirely possible to end up in the position of storming through a dungeon with nary a scratch only to end up thoroughly mutilated by the distracted, almost bored swipes of a thoroughly unimpressed yeti. You need to dally in the dungeon long enough to level up, but you’re always being pushed forward and downwards before you’re truly ready. If you defeat the Big Bad, you win the game and then you get to record your progress on the accompanying campaign guide! You can level up not just within the dungeon, but between dungeon trips. Every adventure ends up with you striding into the darkness as a freshly minted level one traveller, but you can still give yourself an edge that you build up through your activities. It’s all so nice and enjoyable that I’ve found myself in otherwise idle moments reaching for the box for a vigorous solo game so I can advance my paladin just a little bit farther and face another, more difficult dungeon. I’m totally invested in her success now because I have spent a lot of time gradually building her up into a force of considerable speleological efficiency. And yet, for all that, she still often emerges from her explorations covered head to toe in wounds and with only the scantest sliver of her life left. 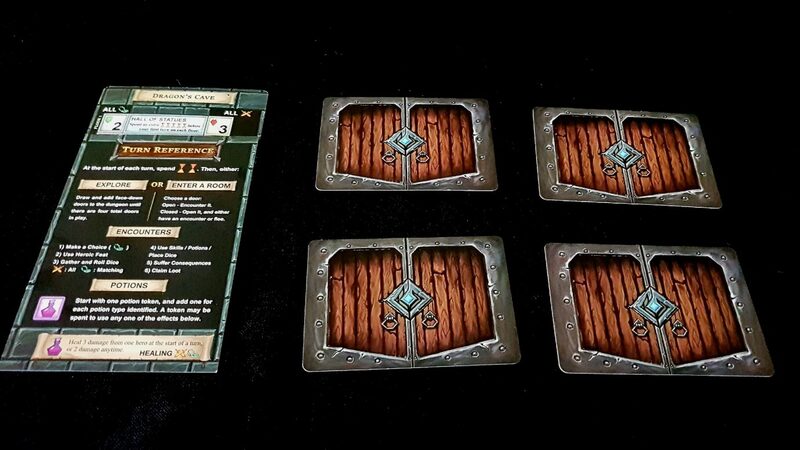 Even dulled as they can be by familiarity with the various moving parts, the journeys within One Deck Dungeon can be intensely difficult to bring to a successful conclusion. In fact they can be too difficult sometimes – at least in the early game. 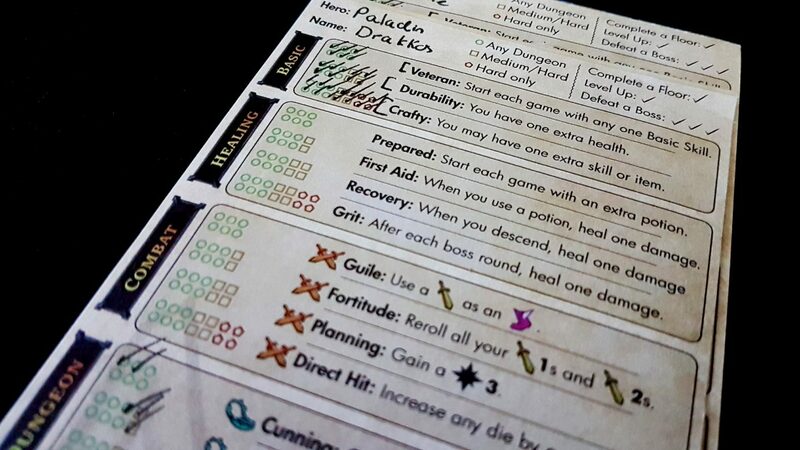 One Deck Dungeon has a difficulty curve that is most politely described as ‘erratic’. Your first few encounters might be against goblins and skeletons, and you’ll build up a few tools with which you can confront the next, tougher denizens of the dungeon. Or you might start off facing a force wall of intense magical power behind one door. Behind another is an ice elemental that saps time from your journey and requires more dice to defeat than you have available. The third door hides an ogre that needs you to roll 27 on combat dice alone even if you don’t have a single one to your name. The last door contains a phantom that takes all the 1s and 3s you roll and discards them from the pool. That’s an unlikely roster of horrible things but it’s entirely possible that it’ll be dealt out. You don’t have to face anything you don’t think you can overcome, and you don’t have to win to progress – but you can emerge from the first few encounters of the easiest level of the dungeon in a state that makes future success an extremely tentative thing. Just because the lowest levels are harder, it doesn’t mean the upper ones are necessarily easy. More troublesome, you can often be left in circumstances where your pace of advancement is slower than the escalation of difficulty. Such expeditions eventually end with your brave adventurer crushed between the jagged fangs of a machine they had no real hope of disassembling. That’s fine and fair if it’s through circumstances of your own engineering, but it feels a little unsatisfying to have been essentially dealt an unwinnable hand from the start. But of course, that’s part of the appeal of a roguelike – you roll with the punches, regardless of how unreasonably fast or brutally they may be sent your way. One Deck Dungeon is far more often fair than it is unfair, and my most enjoyable adventure to date was one where I believed I’d die on the first level. I fought through, survived through lucky rolls and luckier drops, and went on to defeat the yeti at the end. That felt marvellous – it felt like an epic adventure had been earned and undertaken. I swore at the dice. I cheered at the dice. I punched my fist into the air at the end. All of this from a game I was playing by myself in the privacy of my own home. I had the same emotional roller-coaster of despair being slowly transmuted into destiny that accompanies the most epic experience from the most rules-heavy roleplaying game. That almost never happens – even at my most intensely invested solo moments of Star Trek: Frontiers I was at best absorbed rather than genuinely excited. Again though we come back to the main problem – there just isn’t enough in this box to sustain an epic roguelike adventure for very long. The dungeons are, aside from the specific complexities introduced by the boss, exactly the same – the dungeon of the yeti has the same denizens and equipment as that of the dragon, and the lich likewise is hiring from the same recruitment agency that supplies the minotaur. Encounters are satisfying, but they’re also very samey. You go through each dungeon three times, and so by the time you reach the bottom of any one you’ve drained almost all of the novelty out of the experience. The good news is that’s an intensely solvable problem, and I hope Asmadi go bonkers with releasing new expansions for this. There’s one on the way – a Kickstarter I would absolutely have backed if I wasn’t so late to the party with this. However, I think there’s also very meaningful scope for simple extra content rather than new systems. This is one of a few games where I think all that’s needed for expansions to do is give me more of exactly the same, but in ever greater quantities. Themed sets of monsters, and lots of them, would permit dungeons to receive tailored encounter tables without changing the overall shape, sense, and challenge of the experience. New variations in skills and powers likewise would generate a greater feeling that my adventures truly were potentially never ending. For One Deck Dungeon my only real and substantive criticism is ‘I don’t have enough of this in my life’ and that’s about as pro a con as you can realistically have. I look forward eagerly to the day where One Deck Dungeon and its dozens of expansions take up a full shelf or more in my study. I want there to be so many of these that simply storing them becomes a risk-filled adventure of its own. I want the police to me find dead and buried underneath an avalanche of expansions that fell off and smothered me. They’ll look at the scene before them and say ‘At least he died doing what he loved – being crushed to death under the weight of a hundred tiny little boxes’.